"Several methods have been developed for identifying and quantifying microcirculatory dysfunction in septic shock. We can measure buccal, sublingual and subcutaneous microcirculatory CO2-levels. 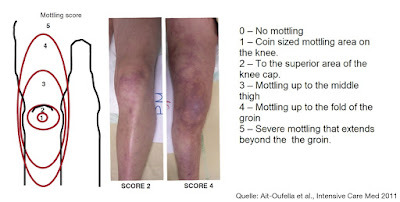 Near infrared spectroscopy (NIRS) measures microcirculatory hemoglobin saturation. Sidestream dark field (SDF) imaging directly visualises the microcirculation. None of those, or the other existing modalities, are readily available at my hospital and most definitely not in the rural or prehospital settings where I sometimes start resuscitating septic patients. Fortunately, there is a ‘poor man’s version’ of all that technology. 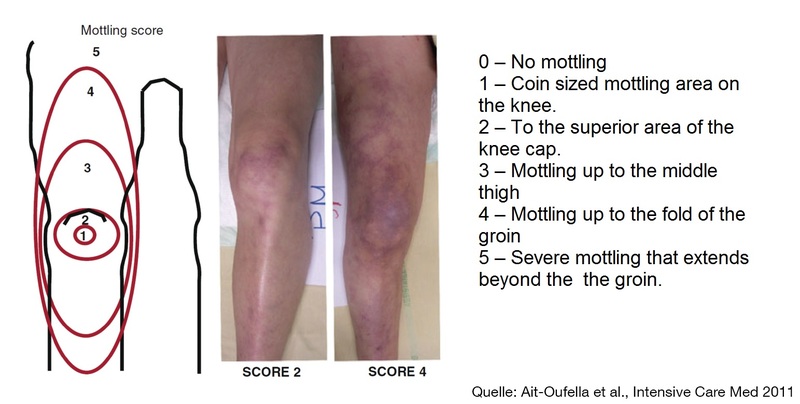 The mottling score."